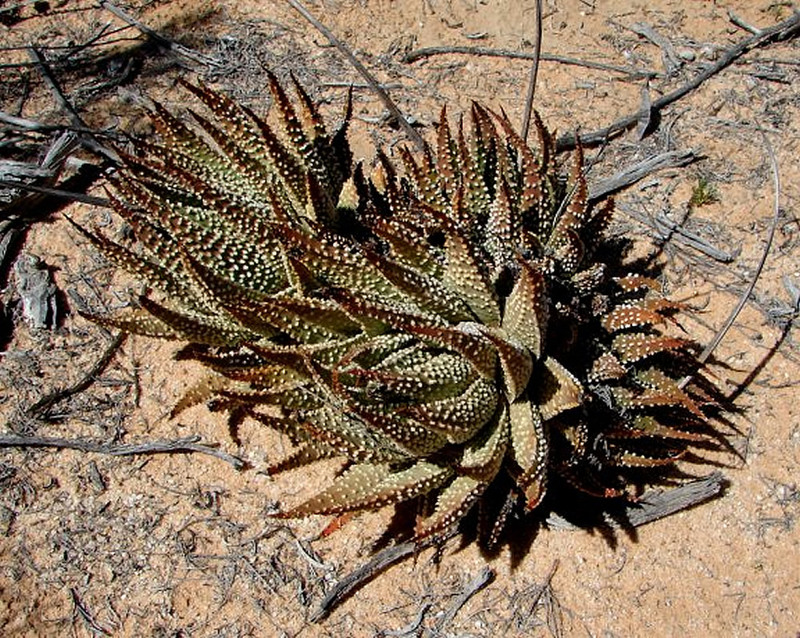 Distribution and habitat: Haworthia is a genus of small succulent plants endemic to Southern Africa. 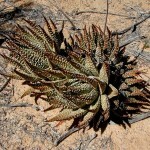 Like the Aloes, they are members of the subfamily Asphodeloideae and they generally resemble miniature aloes, except in their flowers, which are characteristic in appearance. They are popular garden and container plants. Haworthia pumila occurs in a winter rainfall area, which experiences mild frost, -2°C (28°F). Summers are hot, up to 44°C (111°F). Rainfall varies from 150mm (6 inch) (Worcester area) to 350mm (14 inch) (Montagu area). Haworthia pumila is not an endangered plant. 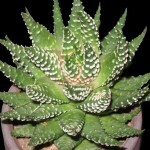 Description: Haworthia pumila is one of the most impressive and eventually large species of the genus. Haworthia pumila has triangular, rather tough, dark green leaves thickly spotted with pearly white warts. Stems are very short and the many leaved rosettes, which can attain a diameter of 15cm (6 inch) and a height of 7-10cm (3-4 inch), appears to be stemless. A cluster of rosettes form quickly (within about a year). The lower, older leaves of each rosette stand erect, but younger ones toward of the rosette centre curve inward. The 7mm (0.3 inch) thick leaves are about 9cm (3 inch) long and 3cm (1 inch) wide at the base. Leaf upper surfaces are flat, while the undersides are keeled toward the tips. The flowers are somewhat larger than in other species, greenish to brownish-white in colour and waxy in texture (usually Haworthia flowers are white, but not in this case). The booming season is early summer and seed ripens in autumn. Houseplant care: Haworthia pumila are classified as succulent – which means that they can cope with relatively harsh waterless hot environments. They are however not frost hardy, which means that for cultivation they need over the winter season either a sunny windowsill or preferably a greenhouse. They are relatively slow-growing plants that offsets to form small clusters with time. Light: Never place Haworthia pumila in direct sunlight. If exposed to summer sun, foliage will shrivel. Medium light suits this plant at all times. When the plants are provided with enough light, than the white tubercles from the leaves became more attractive. It is recommended to move these house plants outdoors for the summer months. Place them in light shaded area, but out of direct sun which can scorch its leaves. Temperature: Normal room temperatures 18-24°C (65-75°F) spring through fall. They have a rest period from mid-winter to late spring and can survive temperatures down to 4-5°C (39-41°F). In winter, if possible, keep Haworthia pumila cooler – around 15°C (59°F) is the optimum winter temperature for this plant. Water: During the active growth period water moderately, enough to make the potting mixture moist throughout but allowing the top centimeter (0.4 inch) or so to dry out between waterings. During the rest period water only enough to prevent the potting mixture from drying out completely. Never let the potting mixture become completely dry, however. Although Haworthia pumila are succulent plants, they cannot survive total drought. 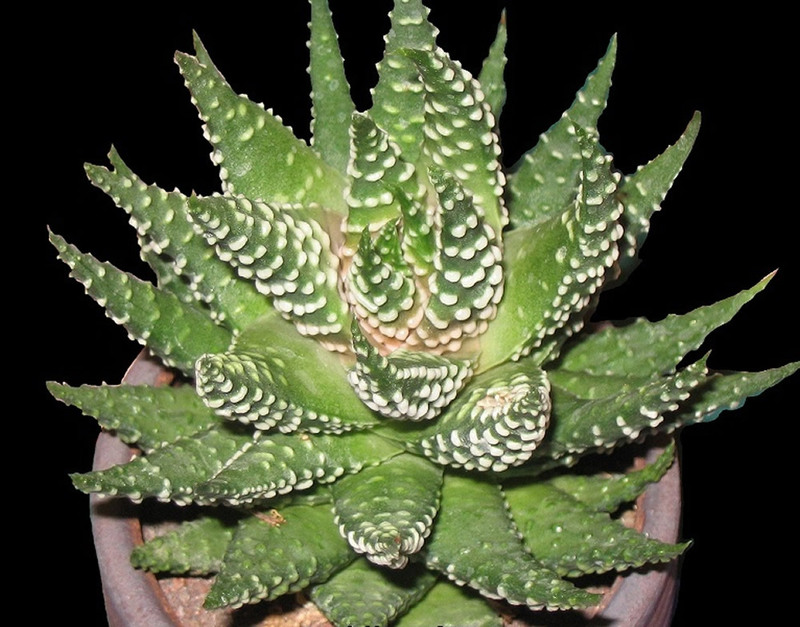 Feeding: It is neither necessary nor advisable to feed Haworthia pumila . Longevity: Haworthia pumila plants live for about 30 to 40 years if they are cultivated properly. Potting and repotting: Use a porous potting mixture composed of one part of coarse sand or perlite to two parts of standard soil-based mixture. 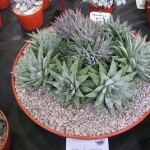 Since Haworthia pumila plants are shallow rooted, half-pots are best suited to the clustering habit of the plants. In potting a specimen always leave a 4-5cm (1.5-2 inch) space between the edges of the cluster and the rim of the pot to allow room for new growth. Repot in spring at the start of the growth period. After pulling or cutting off any dead or shriveled leaves, move each plant into a larger pot only if the rosette cluster covers the entire surface of the potting mixture. The largest pot size needed will be 12-15cm (5-6 inch). A plant that has grown beyond that size should be split up. Gardening: Although the plant will survive mild frost if kept dry – hardy as low -2°C (28°F) – it should be protected from severe cold and prolonged frost conditions. Position: Haworthia pumila requires light shade to bright light, protected from strong midday sun. In shade the body colour will remain mostly green, while full sun will darken it and give it red/brown body colour. The amount of sunlight it can withstand without scorching depends upon the how hot it becomes in the summer in the locale in which it is planted. It will have more colour if it receives more light. During the spring it may be able to take full sun until the heat arrives at the end of spring. In an area that has hot afternoon sun, it may be able to take full morning sun, but requires afternoon shade or afternoon light shade. Can be sunburned if moved from shade/greenhouse into full sun too quickly. Soil: Haworthia pumila are tolerant of a wide range of soils and habitats, but prefer a very porous potting mix to increase drainage. A non-acid soil is ideal. Irrigation: Watering varies depending on the plants position and temperature. Water them frequently when it is warm and dry (but not at the very peak of the heat- they seem to go through a period of summer dormancy at this time) and less to not at all in winter when it is cold. However, Haworthia pumila plants or pots with succulent plants communities are sitting under the grey skies of winter storms and get a lot of rainwater at a time when they are probably mostly dormant. It seems that it is not be a problem for these plants. Individual plants in smaller pots demand more attention. Water ideally when soil is getting dry and not if wet. When in doubt, best to skip watering as too much is worse than too little. Some pots dry out faster than others, too (if glazed, unglazed terracotta, metal, glass etc – all dry out at different rates). Fertilising: Do NOT fertilize newly potted plants for the first year. After that, fertilize once in spring, once in fall with diluted fertiliser at half the recommended strength. Avoid summer fertilizing as plant is in a short rest period. Propagation: Remove the offsets in summer; they should pull away easily. Pot up immediately any offset with roots already attached and treat it as a mature plant. Allow an offset without roots to dry for three days, however, then press it into the potting mixture. At this stage it should be possible to treat the new plant as an adult Haworthia pumila. To propagate by leaf cuttings, remove a leaf and let it lie for about one month, giving the wound time to heal. Then lay the leaf on its side with the basal part buried in the soil. This leaf should root within a month or two, and small plants will form at the leaf base. Haworthia pumila grow readily from seed. These plants have a tendency to hybridize so easily, however, that the results are likely to be unpredictable. Haworthia pumila grows relatively slowly from seed and it takes about 5 years for a plant to reach flowering maturity. Problems: Given correct treatment, this plant is generally trouble free. Stunted growth may indicate mealy bags infestation. Treatment: Occasional watering with systemic insecticides based on Imidacloprid will keep the plants free of mealy bugs. Rot is only a minor problem with Haworthia if the plants are watered and “aired” correctly. Haworthia species can lose their roots periodically. They can rot with too much moisture, especially when there is a sudden temperature drop. 1. Simply leave the plant on its side and when ‘bumps’ which are the new roots start to appear (It may take a few weeks), pot the plant in soil and water normally. Mist it occasionally for encouragement. 2. The second method is more like how it happens in nature and is my preferred method. Be sure the plant is in well-draining soil and water normally. In a month or so, gently tug and feel the roots taking hold–if the roots are not holding, don’t worry. Just put the plant back in the soil and wait a little longer. If the plant has lost its roots and is severely dehydrated at the same time, it may be too far gone to save. But always it is worth a try. When watering, avoid getting the leaves wet. Like other succulents, it is prone to rot if its leaves get too wet. If they are not, fungicides won’t help all that much. Care must be given in watering, keeping them warm and wet while growing and cooler and dry when dormant. Reddish colour can mean many things besides root loss. 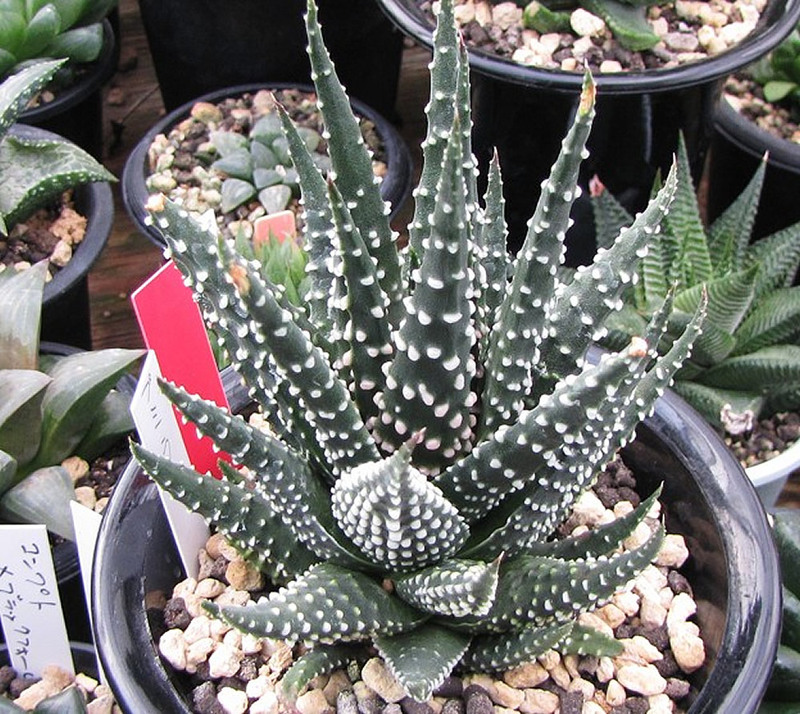 Many of Haworthia turn red when the temperature drops or when they get too much sunlight. A plant can loose their reddish colour turning in green later as the environment condition are changed. Uses and display: Haworthia pumila can grow easily on window sills, verandas and in miniature succulent gardens where they are happy to share their habitat with other smaller succulent plants or in outdoor rockeries. 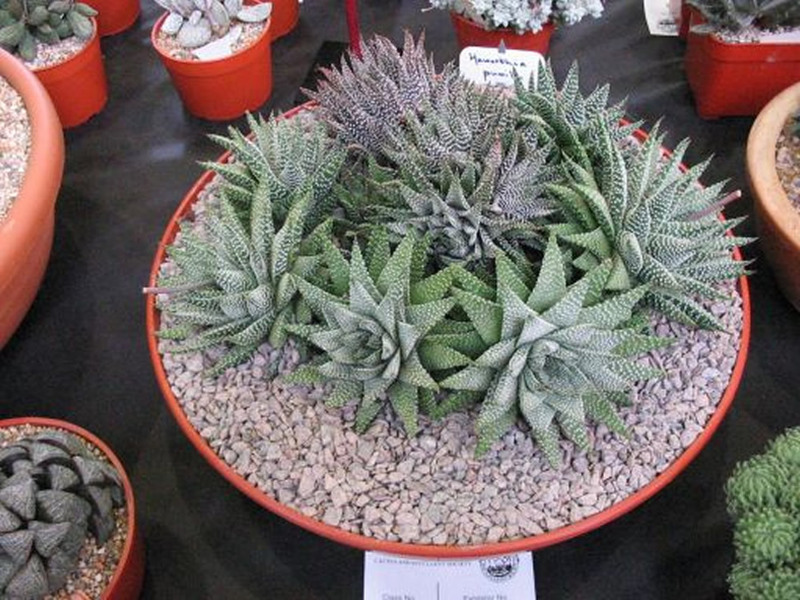 Haworthias are small, making them beautiful additions to succulent and cactus dish gardens.